Bestselling author, speaker, and columnist Ronda Rich draws on her rich legacy as an 11th generation Southerner to celebrate the faith heritage of our country’s Steel Magnolias. 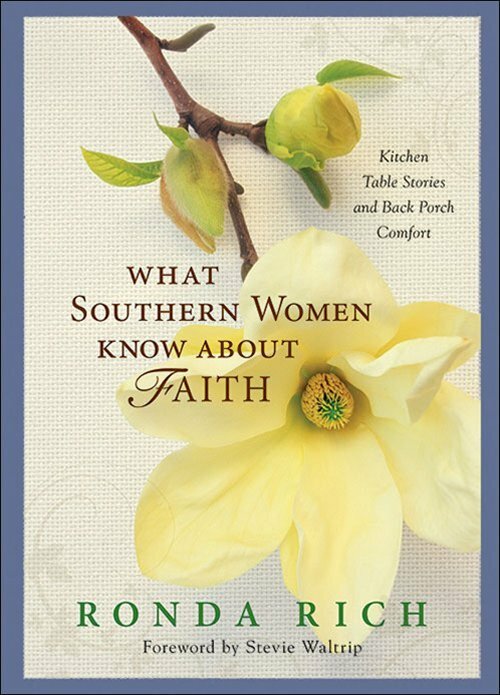 As Ronda shares, Southerners don’t just talk about God, they have a “kitchen-table faith,” that feels like a comfortable, trusted neighbor who sits down and stays for a good, long visit. It’s a faith you live and breathe, day-in, day-out, whether it’s praying to the good Lord as you sit on the porch swing or finding joy in a delicious pan of cornbread. As Ronda says, Southern faith “is a faith that is plain, simple, and sturdy, that is utilitarian in practice and that fits as comfortably in the hands of Southern women as a baby, an iron skillet, a hair brush, a telephone, or a broom.” From stories of moonshine and revivals, Sunday dinners and new Easter outfits, prayers answered and grief’s shared, you’ll discover a faith that supports you when the trials and heartaches of life cause you to stumble, a faith that grabs you by the elbow and steadies you on the path. The foreward is written by Stevie Waltrip.